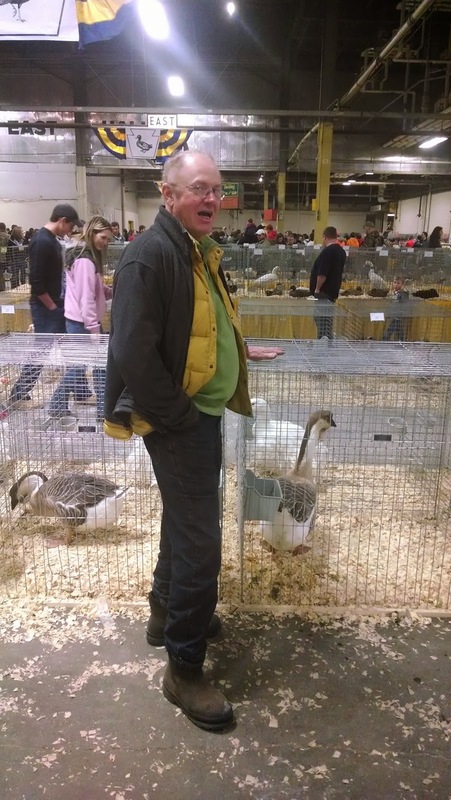 We had the chance to steal away to the Pennsylvania Farm Show. The Farm Show takes place in early January evey year in Harrisburg. It is such a bargain! $10 to park no matter how many are in the car! No ticket cost to get in. Fill up every seat in the ride and visit. January is great for us because we can get there. We can't attend summertime fairs because we are too busy. At this time of year we can take our leisurely time. The first sight we saw as we entered was a long line for the Turkey Hill ice cream. Every day Turkey Hill gives away dixie cups of ice cream and coupons for purchasing more at their stores. People que right up for this. We circled around just as the ribbons were handed out for best chocolate cake. The blue ribbon went to a young man. And the cakes were cut up and handed out too. Apples were sampled. Boer gots were being judged...this is the variety usually grown for meat. Goat...the number one animal protein consumed on earth. And every goat owner had received the memo to wear a plaid shirt. There is an amazing number of poultry and waterfowl at this fair. Chickens of so many sizes, shapes and colors. Geese and ducks too. Time for a bite to eat. Baked sweet potato for the farmers. There were displays of conventional farms, including stacked cages of egg layers. So different from our girls. No toes in the grass here. There were examples of other methods that we don't use. And of feed we don't use either. Bull riding, tractor races, fleece judging. Everyday is something different. We have seen races of ponies pulling 4 wheel carts, draft horse teams pulling stacks of cement blocks, the sheep to shawl competition, little kids on tiny ponies, grown women riding at break neck speed around barrels...for $10 a carload we have to make it. We might even be there twice this year.